Paper clamps feature a butterfly shape design to prevent tearing your important documents and papers. Sturdy wire construction resists flexing or bending to keep your papers securely contained. No. 2 size paper clamps hold up to 100 sheets of paper at once. 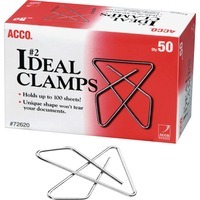 Paper clamps are perfect for office, home and school use.